It's not much of a secret that the toy molds for Whirl and Roadbuster came from a toy line/anime called Special Armored Battalion Dorvack. To me, this was a big point of confusion growing up as smaller versions of the toys were used also in the US in the Convertors robot toy line (I think there has been at least fifty million robot toy lines called Convertors in the course of history). Those were the versions I had. They were smaller and somewhat fragile (not sure if it was cheap plastic or cheaper design due to the smaller size). 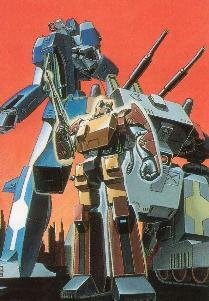 In fact, since Whirl and Roadbuster were practically a non entity in Transformers here in the states (they got a bigger role in UK comics, which I didn't read until I was in college), I specifically always think of them as those Convertors toys. Convertors didn't have much of a fiction, being a cheaper toyline, the story was basically a good guys vs bad guys blurb on the packaging. Often, Wheels and Chopper (their Convertors names) found themselves with other various oddball robots fighting waves and waves of random dinosaurs and monsters. It wasn't until the early 2000's that I learned of a Dorvack anime that one day I'll watch. I'd really like to. I swear I've seen the Roadbuster and other Dorvack designs in some of those random discount bin robot cartoons I've talked about here before that use stolen robot designs. I think if anything, those cheapo robot cartoons make for the ultimate fiction to my version of Wheels and Choppers adventures.